Thank you to representatives from Leicester Lions, John and Michael, who visited Inter Care on Monday 27th November – Pictured above. 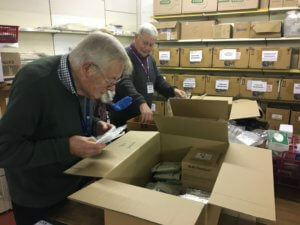 Leicester Lions sponsored consignments of vital medical aid for Nkhamenya Hospital and Katete Community Hospital, Malawi. 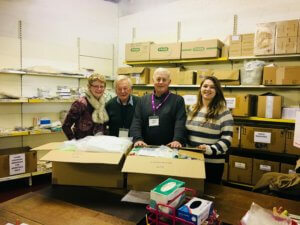 As a thank you from Inter Care, we invited 2 representatives to visit our warehouse and package some boxes that would be sent, thanks to their donation. During their visit, 1 box for each consignment was packaged, Nkhamenya Hospital box valued £850.68 and Katete Community Hospital box valued £407.23. Each year Inter Care sends two consignments of vital medical aid to each partner health unit. On average each consignment costs £830 to send to rural sub-Saharan Africa. Should you be interested in making a donation to send medical aid to our partner health units and visiting Inter Care to package the boxes, please contact Charlotte.